?? CAN YOU BE CHRISTIAN IF. . .?? *You question what they taught you in Sunday School? *You can’t believe what you’re “supposed to”? *You think Jesus was a human being like us — not God walking around in disguise? *You don’t think the Trinity makes sense? *You have doubts about God or the Bible? *You can’t accept that a loving God causes suffering, or demanded that an innocent Jesus die “for our sins” before forgiving us? ?? CAN YOU BE CHRISTIAN ?? You can be faithful to what Jesus taught, in a way that makes sense, without denying your questions or doubts, without checking your mind at the church door! • without pretending that we have all the answers. First, we need to reclaim the freedom of belief, and diversity of understanding, that is present in the New Testament itself. We may need to read it without the blinders of 20 centuries of accreted interpretations to do this. But with the use of our God-given reason, there is no need to rely on “lost Gospels” or to seek occult meaning. 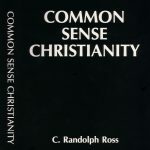 There is indeed a faithful way to respond to the call of Jesus of Nazareth, that does not require us to abandon the “common sense” with which we advance into the 21st Century.